When Weezer covered “Africa,” it was an awesome win for the internet and fandom as a whole; we can now pester our stars into creating the punchlines to our little jokes. Weezer’s choice to cover a different Toto song before succumbing to a Twitter account was a well-played move, but their final covering of a song that’s really only beloved as a meme served as a bleak cultural black hole. Now, we need to endure “Africa” blaring with a semi-ironic drone feeding into itself the same way we did with Smashmouth’s “All Star” years ago. 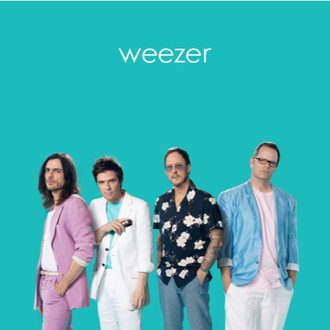 Now with The Teal Album, Weezer has set out to follow up their cover to show that they’re entirely competent in playing other people’s songs with little to no frills in a reliable but mostly boring output. This album suffers from failing to check off either of the real windows for a successful cover. It either needs to provide an original idea to a song that gives it a new depth, or it needs to be performed live to an audience that’s grown tired of your original songs. For example, The Cardigans’ takes on Black Sabbath songs make the listener reconsider the metal icons’ originals and look at them from a new perspective, or The Obsessives usually throw in a cover of Katy Perry’s “Teenage Dream” in their live sets. More often than not, these tracks feel like Rivers Cuomo performing karaoke renditions of these songs. I’m sure people went nuts to hear “Africa” live (partially because it’s a meme), but there’s little rhyme or reason for the studio version past fulfilling a fan’s twitter campaign. There’s sort of a novelty factor to the fact that Weezer’s covering them, but there doesn’t seem like they’re nodding and winking at you either. Even when it feels like they’ve tried to put their own spin on it, such as in “Stand By Me,” it just sounds like a lazy Weezer song. That’s perhaps the worst part about The Teal Album; Weezer are completely competent in their covers. Not that Weezer has ever been a sloppy band, but the fact that these are so precise really drains a lot of pleasure from them. Weezer have never shied away from being silly from time to time, but the only pleasure they seem to take is the occasional distorted guitar. Cuomo’s vocals don’t even reflect that these are necessarily covers he was super passionate about. He could be though; Cuomo has always been unabashedly candid in his love for pop music or corny hard rock. You wouldn’t be able to glean that from The Teal Album. He sounds like he’s just trying to take up an album on a record contract. When it gets down to it, there’s nothing really aurally bad about this album. It’s Weezer performing pretty good, faithful cover renditions of popular songs. What makes it all the more unbearable is that “Africa” is the lead single. Not a bad song by any stretch, but the meme-ification of the song has made it so cringe-worthy that I wince when it comes on anywhere. It’s hard to not hear “Sweet Dreams” or “Paranoid” without a touch of the same so-ironic-it’s-not sheen as that single. Weezer has faced plenty of ups and downs in their long career, and they’ve never been afraid of giggling while doing something, but it doesn’t really seem like that’s occurring here. All the joy is sucked dry. Weezer’s Black Album will be out in a few months, and to some extent, The Teal Album is a fun thing to throw at fans as a surprise. Still, the lack of any silly gesture or sense of fun has made these just lifeless representation of the joke of Weezer’s career that we’re not sure if they’re in on it. This didn’t need to exist.